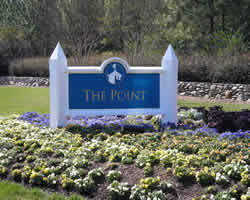 The Point, a 1,200-acre luxury community just north of Charlotte, encompasses nearly 18 miles of Lake Norman shoreline. Nantucket-style homes and a Greg Norman designed golf course with 13 holes that play along or over the lake are just a couple of the alluring features here, where homesites average more than an acre. The club facilities include a tavern, general store, village green and meeting house. A full-time activities director plans community events here all year long. To view information on the Pointe homeowners association, click here. Homes in The Point range from the $500s to $5 Million. Looking for The Point homes for sale? Looking for The Point homes for sale? Search our local listings database for access to listings in The Point and surrounding communities. Whether you want to buy or sell The Point real estate, you can browse through properties or find a wide variety of real estate resources available on this website. If you are looking for a REALTOR® for The Point, choose Debbie Sloan. As your The Point real estate agent, Debbie Sloan can assist you with all of your home buying and selling needs. We can provide you with access to the Lake Norman local listings database and offer our experience and knowledge to make the home buying or selling process easier for you and your family. Contact Debbie Sloan today to get your home search started!